There will be a dedication of the recently installed mural after the conclusion of the 9:30 worship service on Sunday December 13th, 2015. At the end of the service, worshipers will move to the mural space in the stairs leading to the education wing where the mural is installed. For those with mobility issues the elevator leads to a wonderful vantage point on the third floor. Lead artist Doug Haynes will share a few words about the artwork at the dedication. This work was initially proposed by Hyunji Haynes. The initial sketch was created in April of 2014. In the intervening time Hyunji and Doug cut and painted wood panels with individual parts of the mural at their home. 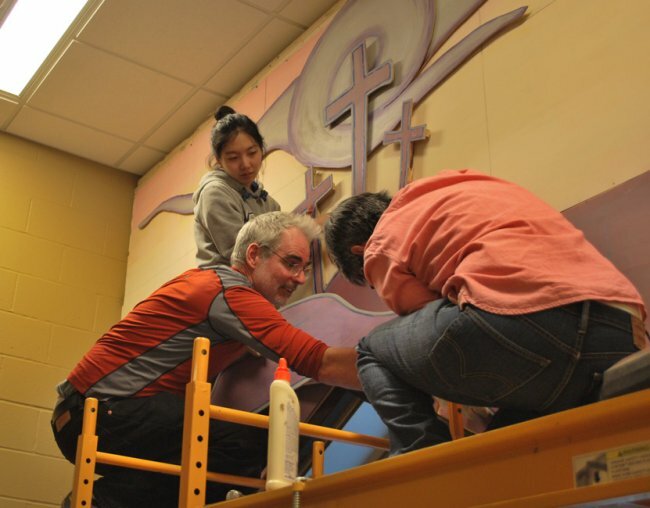 Much of that work was completed by the summer of 2015, however the border remained unpainted until the American Baptist Churches of Wisconsin Annual Gathering for all ages. At that event, participants of all ages took up a brush and added their own prayers in the form of painting. Haynes is grateful to the many people who helped with the project at various stages especially those who assisted in the installation over the thanksgiving weekend.